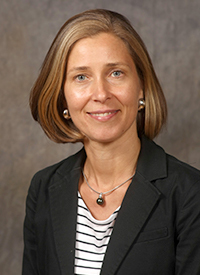 Chrisann M. Newransky’s teaching specializations include health services utilization, health disparities, integrated health, vaccination and social inclusion. She has authored and co-authored numerous book chapters and academic articles in journals including American Journal of Preventive Medicine and Journal of Social Service Research. She has also presented at several esteemed research conferences across the United States. Newransky earned both her Ph.D. and her M.S.W. from Boston College. She also holds an M.A. from Brandeis University and a B.A. from the University of Michigan.